Inkheart… The movie title sounds like a romantic story of a man who pens his undying love for his one and only true love…but it’s not. The movie is about a father when he reads aloud can make characters from the book enter his world, but someone from his world goes into the book. Imagine if he read King Kong aloud. My husband and I enjoyed dinner and a movie with another couple this past weekend. Quite a treat for us, since we usually only get to go to Chick-Fil-A with our children. I actually wanted to see Underworld: Rise of the Lycans but I was outvoted. 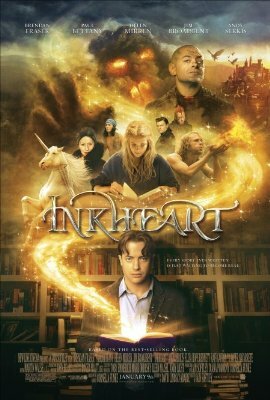 So, I settled in my theater seat to watch Brendan Fraser (Errr… I mean… Inkheart). I figured it had to be a decent movie. I loved Brendan Fraser in The Mummy and Journey to the Center of the Earth. This movie was good. Just good. Nothing really special. A good story with a happy ending. I can imagine what was happening in Underworld: Rise of the Lycans though….. Vampires against Werewolves….Just like the Twilight books I am enjoying. Inkheart is a book of medieval castles and strange creatures where the movie gets its name. Come to find out there is an Inkworld Trilogy, so I can see more movies developing from this one. My favorite character was Dustfinger played by Paul Bettany, who was also Silas in The Da Vinci Code. I don’t want to give too much away about the movie. I know that my 9 year old son would have loved it. Shag and I told him we went to see Saw V, so he wouldn’t be mad at us for going without him. Hey… give the movie a try. And if you can, let me know how Underworld: Rise of the Lycans was. I doubt I will get another adult night to go see it anytime soon. wait a sec…Gena wants to see Underworld 10 or whatever (a geek favorite) and reads the Twilight books (a tween geek fave) and saw the Mummy (another geek adventure flick)…i think Shag may be converting Gena…interesting. Now if Gena goes to see Watchmen i will be really impressed! Thanks for the fresh voice Gena! I want to see Inkheart as well because I’m a huge book geek and the movie is based on a great, clever story by Cornelia Funke. I think it should be mentioned that it’s based on a book because even if the movie is incredible, the book is always better. AND your 9 year old son may like to read it and the sequel if he enjoys the flick. Someday, your son will read this and know that his life has been nothing but lies . . .LIES, I SAY! So, how do you get out voted by one person, anyway? The Red Skull can read between the lines. For Valentine’s Day you must get a babysitter for the kids and take your wife to somewhere other than Chick-Fil-A. Though, the Red Skull says the fast and courteous service at Chick-Fil-A makes them a real-life Legion of Super-Heroes! And let her pick out the movie!! Though, the Red Skull says AMC Theaters is a veritable Planet Apokolips! Red Skull is in the wrong comics universe today.